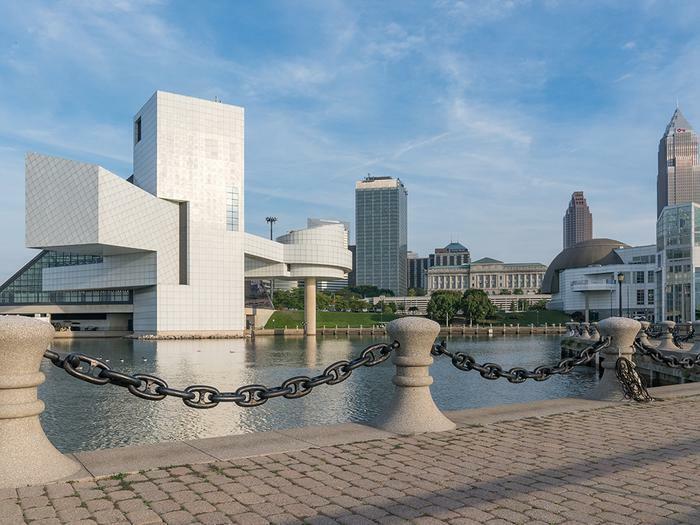 You don't have to be a veteran of the 1960s music scene to appreciate the Rock and Roll Hall of Fame in Cleveland, on the city's Lake Erie waterfront. And the summer of 2017 might be a great time to visit. First of all, if you still have framed ticket stubs from that Doors concert you attended way back when, the exhibits in the Hall are certain to get your juices flowing. But young people, particularly young musicians, will find a visit to the beautiful, pyramid-shaped glass building stimulating as well. There, they can not only breathe in the air of early rock, they can also feel the connective tissue of music history, linking a contemporary artist like Kendrick Lamar back to early hip hop, and from there back to the King of Soul, James Brown. The exhibits tend to change, but always focus on artists and groups who have earned their way into the Rock and Roll Hall of Fame. Recent exhibits have included Janice Joplin's Porsche and the instruments, equipment, and concert posters of groups like The Byrds and The Grateful Dead, who today are not only appreciated by rock historians, but still have legions of fans. Some exhibits have focused on particular cities, and their influence on the music genre. The Memphis exhibit highlighted Sun Records and Sam Phillips, who worked with legends like Elvis Presley, Carl Perkins, and Johnny Cash. Of course, a visit to the Hall means there's always a good chance you'll get to hear some music. This summer, the Hall has announced more than 50 live concerts and other events. June 7 is Prince Day, honoring the music of the prolific and eclectic artist who died last year. The Hall will throw a U2 tailgate party on July 1, in advance of the band's Cleveland concert. A major rock show is scheduled for July 22, headlined by Drive-By Truckers. Meanwhile, a number of free music events are scheduled throughout the summer at the Outdoor Main Stage. Walking through the Hall is sort of like walking through a modern airport or shopping mall -- it's open and has lots of glass. Tours are self-guided and visitors follow well-defined paths. The induction ceremonies into the Hall are always big events, and are usually held outside Cleveland. For example, last month's induction took place in Brooklyn, though the Hall has announced the 2018 ceremonies will return to the Hall. Tickets can be in excess of $100, but true music fans call it a once-in-a-lifetime experience. The cost of visiting the Rock and Roll Hall of Fame is $23.50 for general admission, $21.25 for seniors, and $13.75 for children six to 12. Children under age 6 get in free. Of course, if you have a museum membership, admission is free. You'll find group rates here. Cleveland International Airport has good connections from just about everywhere. It's served primarily by Air Canada, Delta, Frontier, JetBlue, American, United, Spirit, and Southwest. Located on the city's southwest side, the airport is only about 20 minutes from the Rock and Roll Hall of Fame. The Hall also has accommodation package agreements with several nearby hotels, some of which offer shuttle service to and from the Hall. You can check them out here.